LANA products were born under the spirit to bring everyone closer to a healthier version of themselves. With careful thought of even the slightest details to its quality, we believe Lana can help you to eliminate any excuses to not be healthy. LANA FitMat is a premium quality mat designed to meet your expectations of a reliable tool to provide a great workout anywhere. Another important note is that it is also eco-friendly. It doesn’t harm the environment during the manufacturing process, nor does it leave any harmful substances or residues after. 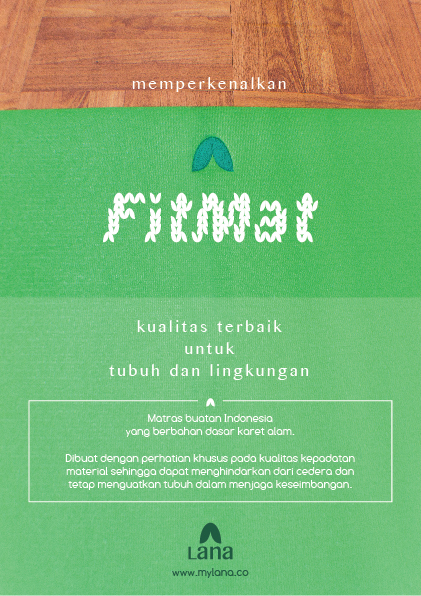 LANA FitMat is a complete mat that is guaranteed to bring you the best mat experience. Unlike any other mats that give more thickness to provide nice cushioning, we pay more attention on giving the right amount of density. So our users will get the best cushioning, minus the bulk size. The careful research we conducted on LANA FitMat’s material also resulting in LANA FitMat’s perfect ability to absorb shocks without the feel of ‘sinking into the mat’. LANA FitMat’s upper surface is smooth and pretty, but amazingly, it is also strongly grippy. Users will feel from the very first use that their hands and feet are locked in the right position, from the beginning until the end of a workout session. On the other hand, LANA FitMat’s special dotted texture underneath is an assurance that it will not move an inch from where it is being put. It stays still, like a strongly-built skyscraper. LANA FitMat’s closed-cell surface is the best in its class. Meaning that every drop of sweats—along with its germs and bacterias—will stay out, not inside. This makes cleaning LANA FitMat an ease, the only thing needed is a damp, delicate cloth to wipe. LANA FitMat is natural. Even from the first time getting it unpacked, you will feel how organic it is. LANA FitMat doesn’t contain anything hazardous for the body or the environment.